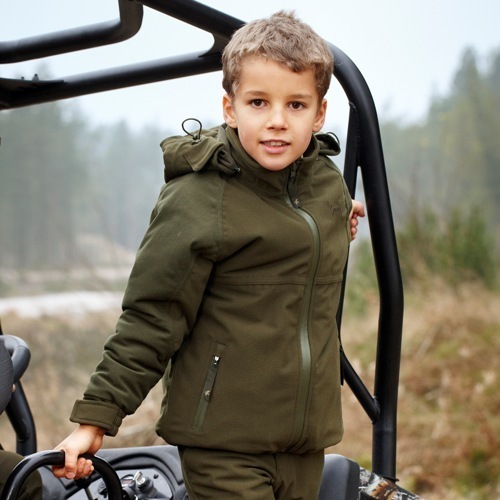 The Seeland Eton Kids Jacket is soft yet waterproof and breathable with a hood. We particularly like that tucked in an inside a pocket is a lightweight orange reflective vest for extra visibility and safety if necessary. The Bonart Childrens Keeper Country Jacket is one of our best selling children’s coats as it is also smart enough to wear “out and about”. For waterproof all in one trousers without the need for children’s over trousers or leggings, look no further than the Seeland Eton Kids Trousers which match the jacket and together provide a fully waterproof beating outfit. They are also available in camo: Seeland Eton Kids Trousers in Realtree . Overtrousers such as the Bonart Childrens Poacher Overtrousers are hardwearing and can be teamed with normal jeans or trousers to keep your little ones clean and dry. Alternatively, for kids stud on leggings, the Junior Cordura Leggings attach to a belt. Children beaters can look just as smart as adult beaters with the Seeland Douglas Kids Windbeater Jersey which is specially lined to make it windproof. Together with a warm kids shirt such as the Bonart Children’s Kimbolton Lined Shirt, your mini beater will stay warm even on the coldest of days. To complete a really dashing look, there are plenty of childrens shooting ties to choose from such as the Children’s Standing Pheasant Tie. A children’s waistcoat or gilet such as the Seeland Kids Winster Waistcoat or the Bonart Caribou Children’s Fleece Gilet is a useful layer to have, either worn with or without a jumper under a coat. Complete your child’s beating outfit with a warm pair of gloves, hat and welly boot socks. The Seeland Conley , Camo Fleece Gloves and Hunter Kids Fleece Welly Socks are all ideal. For a cheap pair of kids wellingtons, the Hoggs of Fife Lomond Junior Wellies are a bargain in the sale at £5. Last but not least, a cotton hankie such as the Spotted Cotton Handkerchief will help sort any runny noses!